One thing was certain before the Bauer National Invitational Tournament even began: the championship game would be the best ticket in town before the high school varsity season starts. 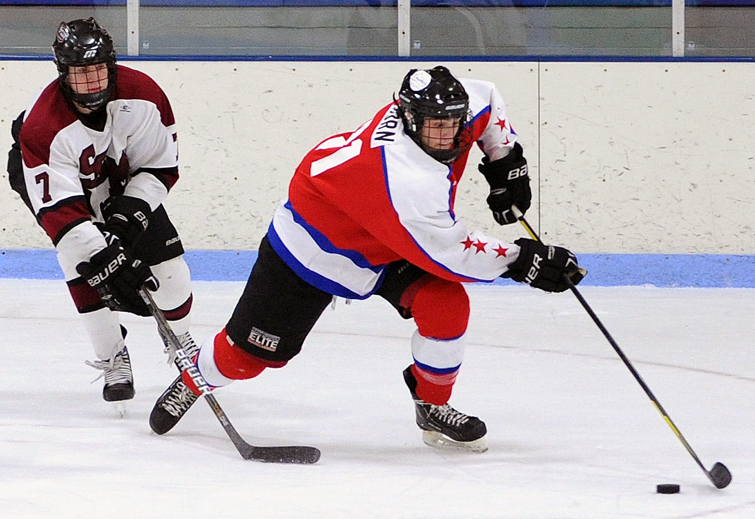 Living up to expectations was the Sunday, Nov. 6, showdown between Shattuck-St. Mary’s and Minnesota Red. Unfortunately for Horn and his Minnesota Red teammates, Shattuck-St. Mary’s proved to be the best of the best as the Sabres used a dominant second period along with solid overall play to capture the 2011 Bauer NIT title with a 5-3 victory. Shattuck-St. Mary’s win comes 364 days after losing 5-4 in overtime to Minnesota White in last year’s Bauer NIT championship game on Sunday, Nov. 7, 2010. Then playing for Minnesota White, Horn provided the game-winning goal. Despite taking two periods to find the back of the net, Minnesota Red displayed the offensive power that had propelled it to the championship. A quick wrist shot by Hill-Murray's Jake Guentzel that found the top left corner and a power-play goal by Maple Grove's Jordan Gross for Minnesota Red cut Shattuck-St. Mary’s lead in half during the third period, but the Sabres answered back with a power-play goal of their own. Needing to gain every ounce of possible momentum, last year’s NIT championship game hero knew he needed to take things to a higher level. Horn got what he wanted, scoring with 3:12 remaining in the third period but the goal would not be enough. Although the final score this year was not in Minnesota Red’s favor, Horn still managed to find a silver lining within the silver medal. “This was my last hurrah (in the Upper Midwest High School Elite Hockey League),” Horn said. “I'm a senior and it's the last time I'll have a chance to play with these top players in the state. It's weird because you've played with them ever since you were seven or eight years old. You grow up playing with them, some of them become your best friends and then they go to different schools." Horn finished the three-game Bauer NIT with five points (two goals, three assists) following a 23-point (12 goals, 11 ) effort on Team Northwest in the Elite League. With all the glamour of the Elite League and the Bauer NIT behind him, Horn is excited to begin focusing full-time on his captainship duties at Benilde-St. Margaret’s. “Oh yeah -- I'm ready to get going,” Horn said. Horn and the Red Knights are ranked No. 2 in the Class 2A preseason poll and will kick off the season on Tuesday, Nov. 29, at 7 p.m. when they travel to face St. Cloud Tech at the National Sports Center in St. Cloud.